I have been very fortunate to be a part of the team at ZYZZYVA since taking on the redesign of the print journal and website a few years ago. 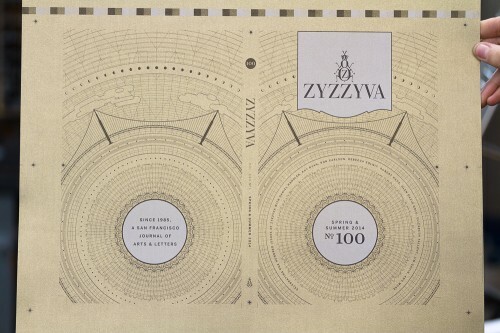 Despite ZYZZYVA’s three-decades-long run, since I’m relatively late to the party, I luckily did not have to wait very long for a special milestone to come along—the 100th issue. Laura Cogan (editor), Oscar Villalon (managing editor), and I had been talking about ZYZZYVA No. 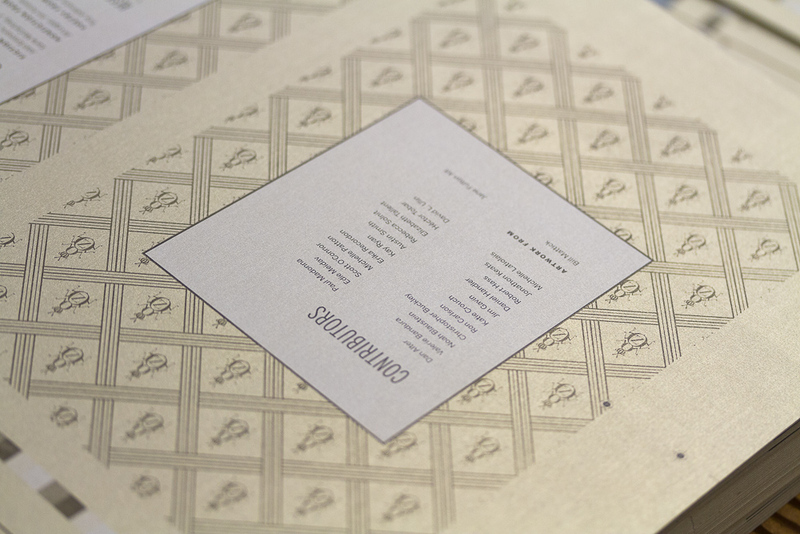 100 ever since the beginning of our working relationship, but in the latter half of 2013, we began our work in earnest to weave together a creative direction for the issue’s special design. We have always put a great deal of effort into every issue of ZYZZYVA. The 100th issue was no different in that sense, but we knew we needed to differentiate it from all of the others somehow. Since our redesign—which debuted in issue No. 92 (Fall 2011)—every cover of ZYZZYVA has featured selected artists’ work, surrounded by a context in which that work would conceivably be seen (at least in our imaginations). An infinite gallery, of sorts. 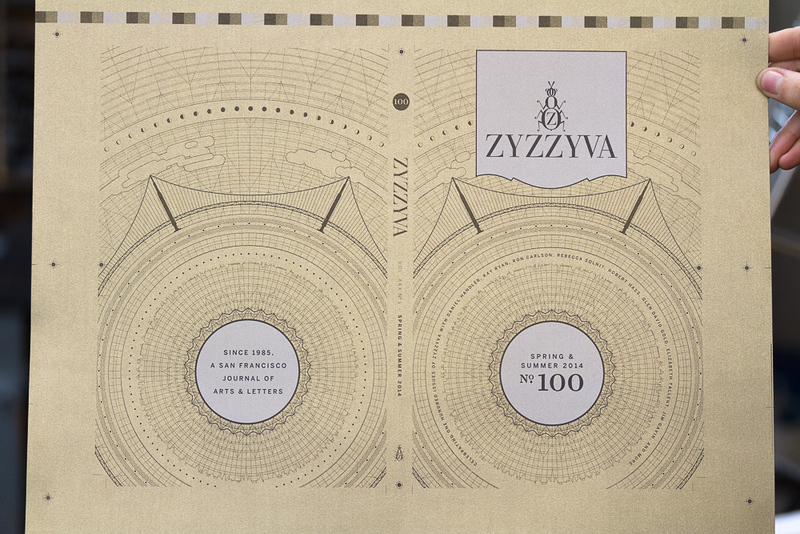 As the designer, my goal has always been to honor and support the artwork that graces ZYZZYVA’s cover. No. 100 presented me with a unique challenge and a fantastic honor, in that the cover design is the artwork. 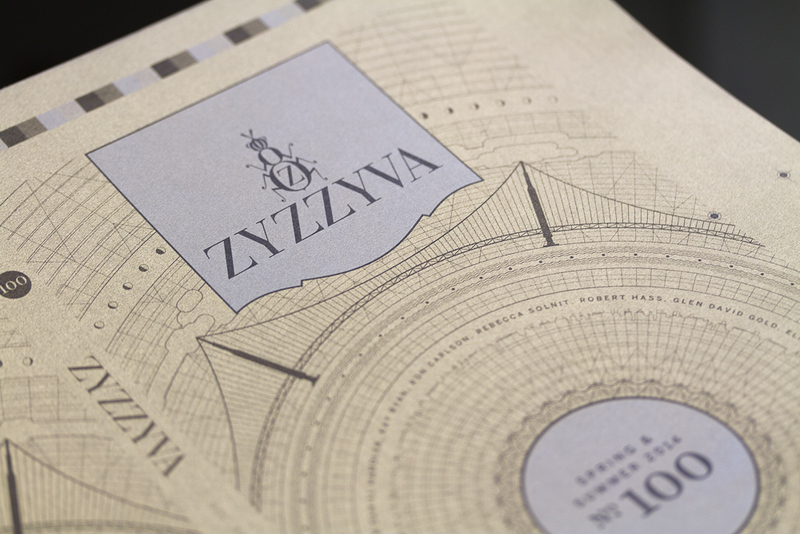 San Francisco is ZYZZYVA’s home base, and serves as nothing short of the journal’s muse. Our goal was to depict San Francisco on the cover in a very ZYZZYVA way. 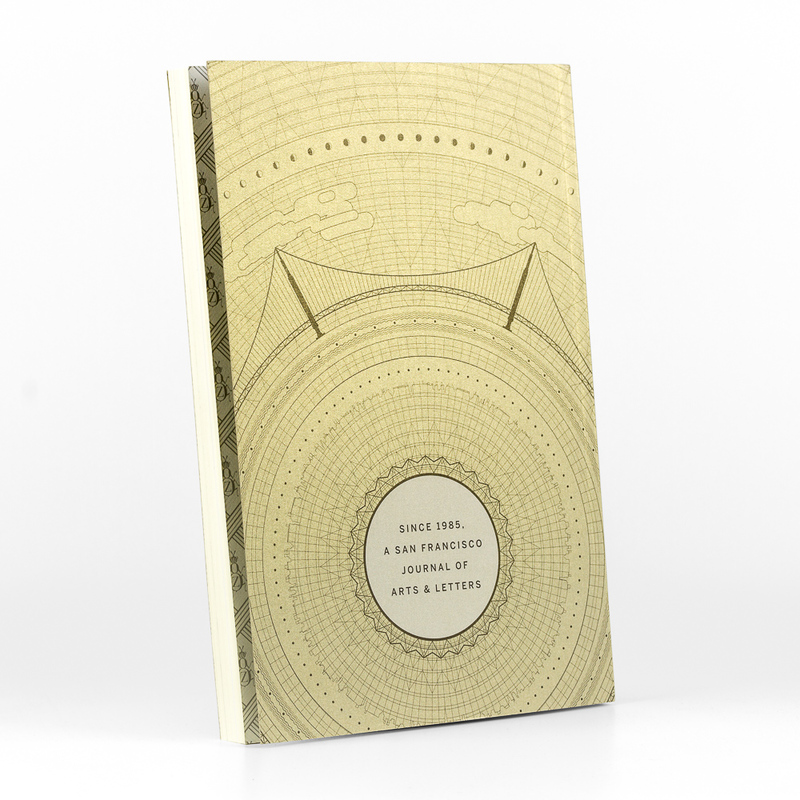 The illustration draws influence from the Art Deco period of the 1939 Golden Gate Exposition through the present day, spanning milestones in Bay Area and ZYZZYVA history, while maintaining the overall composition of ZYZZYVA’s covers since the redesign. 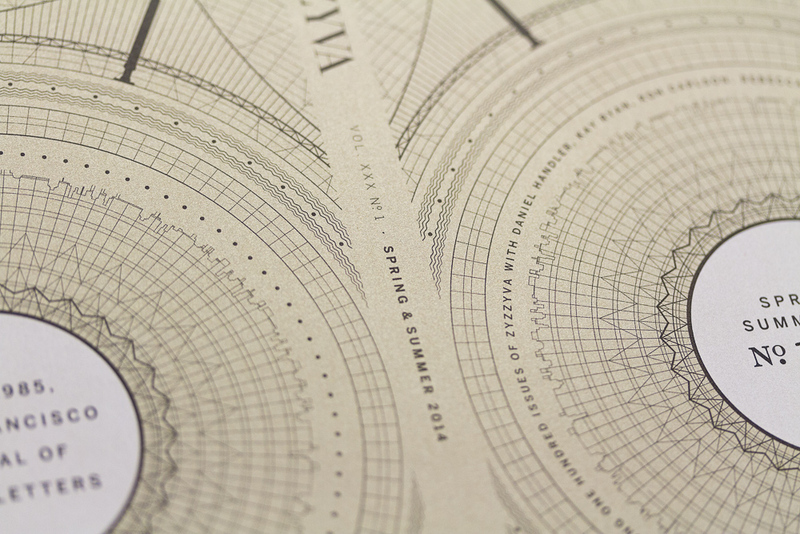 To emphasize and celebrate our love of print as a medium, we wanted ZYZZYVA No. 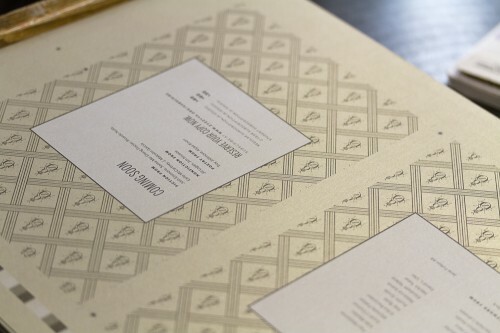 100 to be printed in a unique way. After months of developing our concept, we decided upon a metallic paper (Curious Metallics Gold Leaf), printed offset with two spot colors (opaque white paired with a mixture of black and metallic gold). The cover was masterfully printed by “the oldest print shop in the Pearl,” Gann Bros. Printing, in Three Steps Ahead’s new home base of Portland, Oregon. The hundredth-issue milestone is getting ZYZZYVA some very deserved attention, including impressive interviews with The Washington Post and The Millions. The way that the issue looks and feels can only be truly experienced in person. The paper and printing, just like the writing and art within, has an iridescent quality that can be appreciated when viewed from different angles. I strongly encourage everyone to give themselves and their friends the gift of ZYZZYVA. You can purchase ZYZZYVA No. 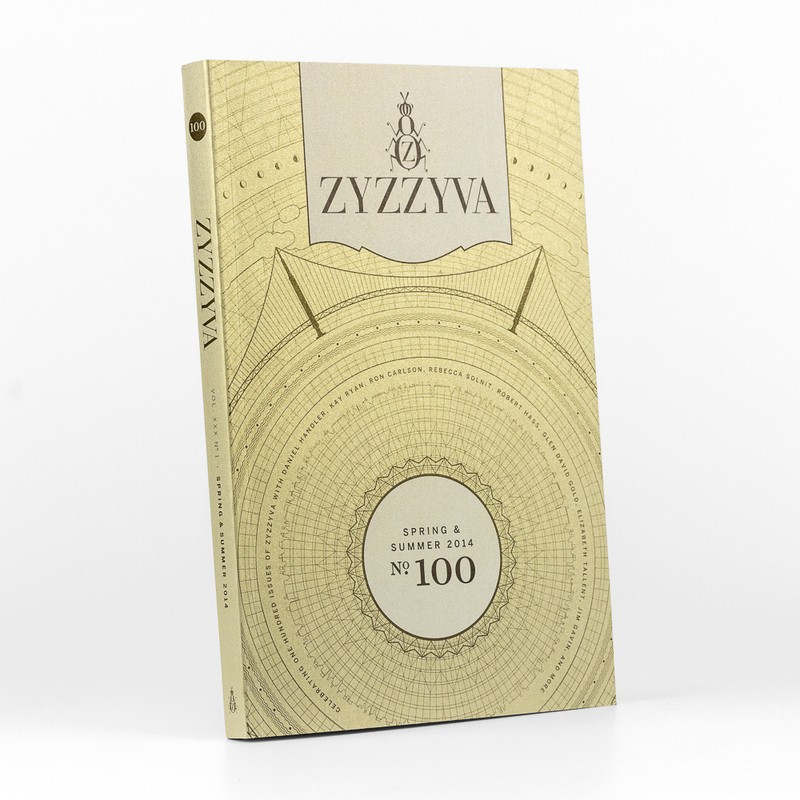 100, as well as subscriptions, bundles, t-shirts, and other back issues online at www.zyzzyva.org/subscribe.